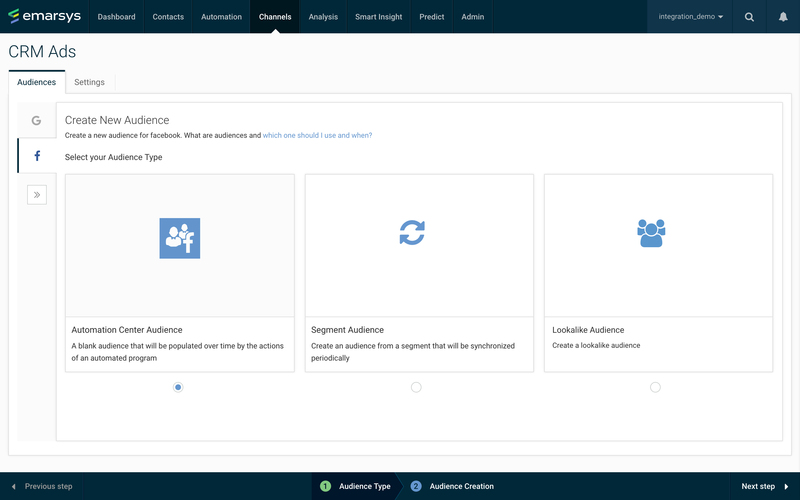 With the new Emarsys CRM Ads it is possible to connect purchasing and behavioural data to advertising campaigns in real time. 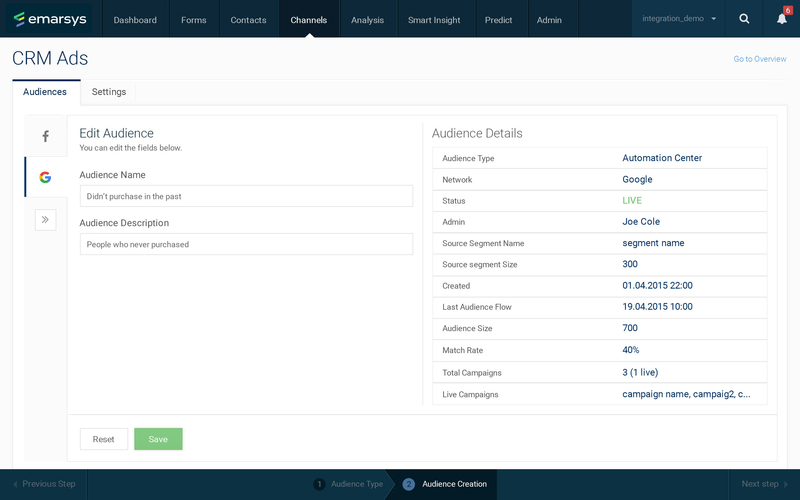 This new CRM Ads feature allows the marketer to use their CRM, purchase, and behavioural data from different channels (e.g., mobile, web, email) to use in their advertising campaigns. This way marketers can target their offers and create personalised ads. Marketers are able to match contact data and reach their customers on Google search, Gmail, Facebook, YouTube and Instagram. First off, it’s not only cookie-based marketing; The data includes matching on email address, hopefully creating an aligned brand experience across various advertising channels and devices. With the CRM Ads function marketers can pick contacts and make segments to which they can deliver the right content. Also, marketers can create look-a-like audiences which mirror their (best) customers or segments. 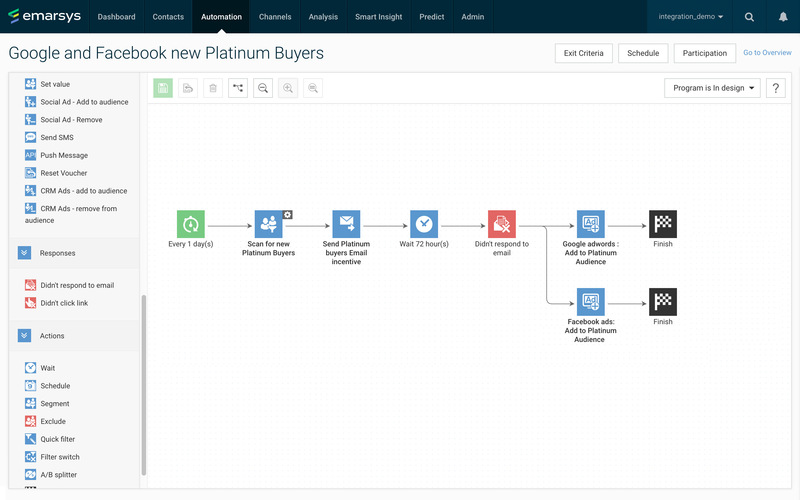 Marketers can use CRM Ads in their automated marketing programs and workflows. Below for instance, we see a workflow that runs daily to send an Email Incenticve. Mon-response to the email triggers the action to add them to the marketers’ Facebook ad segment and Google AdWords audience for those subscribers. Emarsys promises the opportunity to boost returns on advertising spend. Marketers will be able to select specific contacts that they know are valuable and reach them through advertising. The possible results of each campaign are measured and can be seen in the reporting and analytics dashboard that Emarsys offers. 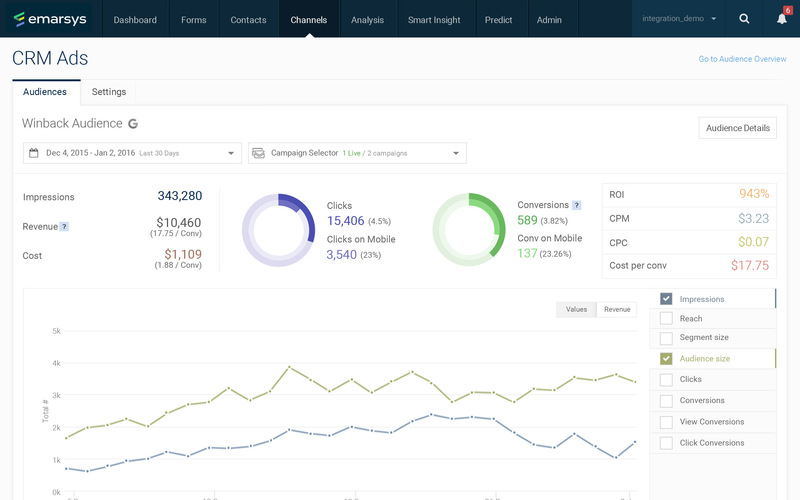 Below you can see a screenshot that shows impressions, revenues and costs and calculates a CPM, CPC and ROI as well as a Cost per conversion.